Every year, on the day before we leave for the Cape, my husband painstakingly packs the car with his vast array of windsurfing gear. To the untrained eye, it’s a bewildering hodgepodge, but it all makes sense to him. When I asked him to describe what’s included, he was more than happy to oblige. 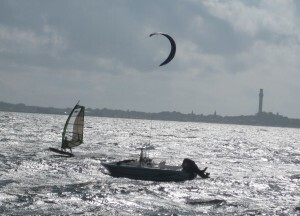 He rarely has the chance to talk about his beloved sport, as there are few fellow windsurfers in our area (due primarily to a lack of water and wind). Ideal conditions are rare at the Potomac or the Chesapeake (at least on weekends when H can get there). This is one reason we go to Cape Cod each year. And it’s because of the Cape that H discovered windsurfing. As a teenager, he got hooked when he took a lesson on Gull Pond in Wellfleet. According to H, here’s what he packs for the trip: four sails (ranging in size from three to seven and a half square meters), one board (he has two, but he only brings one), three masts, two mast extension tubes, two booms, four fins in a range of types and sizes (including a new weed fin called the “Reaper,”) a wind meter, life jacket, harness, three wet suits, protective booties in two different thicknesses, a waterproof watch, a repair kit consisting of epoxy, sail tape and a “ding stick,” sunglass floaties, piles of velcro straps, ropes and “lashing straps,” and finally, two universal joints. The board is strapped to the roof rack, but everything else must be inside the car. This is unfortunate for our daughter, who, during the long drive, is wedged into a tight pocket. If she has a growth spurt we’ll have to get a bigger car. 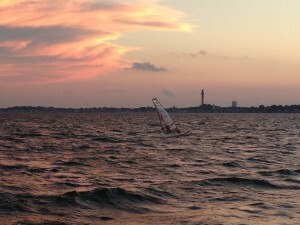 Optimal wind is not a given even at the Cape. There are years when the equipment sits virtually unused, a sad, sandy mound in the corner of the living room of our cottage, a painful reminder to H of what he’s missing. When this is the case, he spends lots of time standing at the edge of the bay, staring dejectedly at the wind meter. People relaxing on the beach may comment knowingly, “Too much wind, huh?” This has never been the case, and H gets a little exasperated at the non-windsurfing public’s lack of wind know-how. It is one super-frosty day in hell when there’s too much wind for the windsurfer. Typically, if conditions are comfortable for lounging on the beach, the wind is utterly inadequate for H’s purposes. It’s when the beach umbrellas begin to take flight that his mood begins to lift, as well. 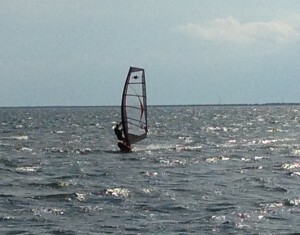 Perfect wind for windsurfing often occurs only under perfectly miserable conditions. When the sand whips your legs with the sting of a million needles, the spray from each violently crashing wave drenches you and your canvas chair, the sky is low and threatening, the temperature has dropped to wintry, and beach-goers seek shelter in their cottages, that’s when H will be merrily heading out, into the midst of the water and wind. 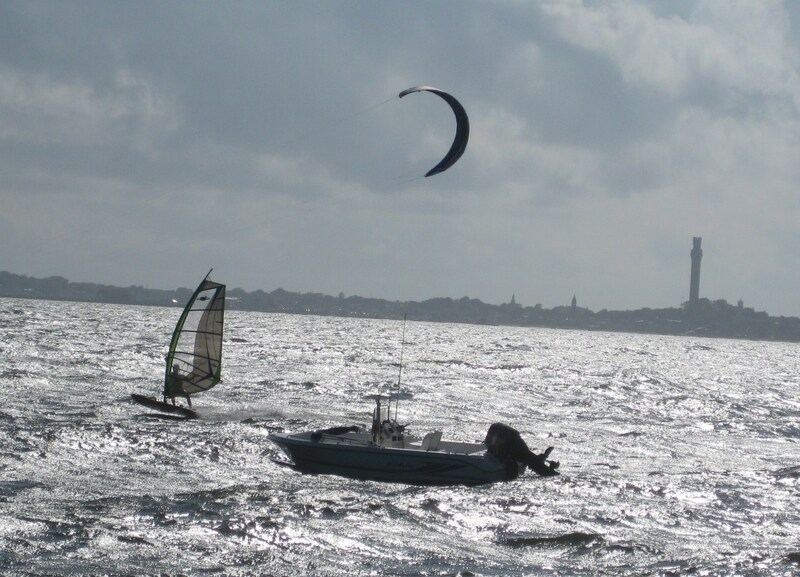 H, catching some air, is joined by a kite boarder, on what appears to be a silvery sea of mercury. It takes several trips to lug the many required pieces of equipment down to the water’s edge. Sometimes D or I help; more often, we simply stand inside the cottage in mute witness, amazed at his fortitude, marveling that such terrible weather cheers him so. Once the craft is assembled, he tugs it through the thick seaweed that floats in the shallows of the bay. At last, he’s off, and for a few seconds, D and I can see him speeding away, toward the curve of Provincetown. Very quickly, he disappears into the gray mist of sea and sky. We check on him periodically, because he’s always out far longer than anyone on shore deems possible or advisable. D and I bundle up in hoodies and rainwear and trudge down to the water, scanning the horizon for a glimpse of the sail. After a while we see a speck in the distance: it’s H heading toward shore. We assume he’s had enough; surely he’s coming in, exhausted and frozen. But no. He’s just turning around. 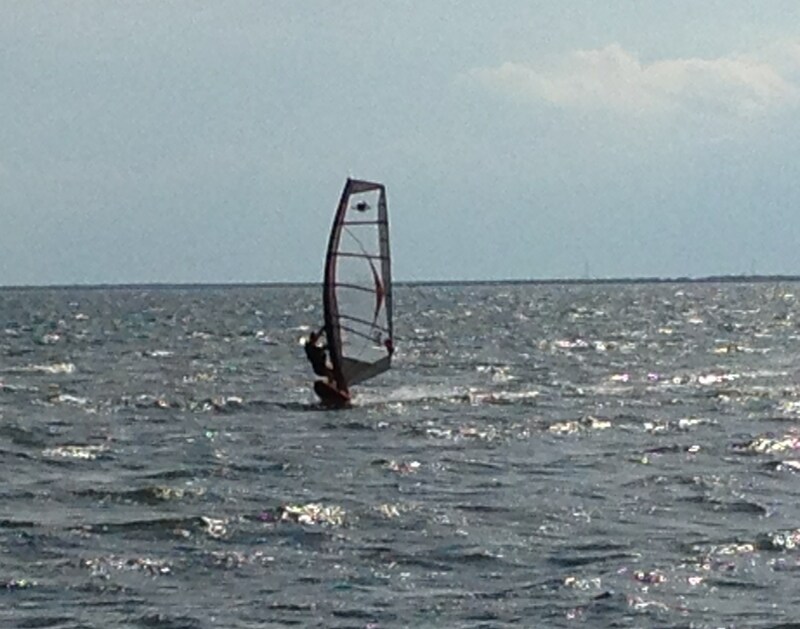 He gives us the thumbs up and lets the wind pull him up and out of the water again. 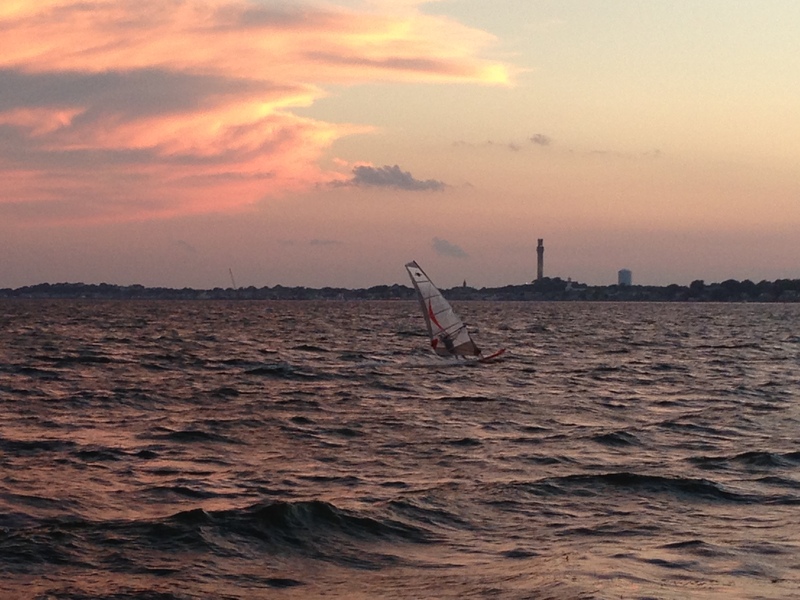 (Skilled windsurfers needn’t struggle to pull up the sail, as novices do.) D and I retreat to the cottage and consider playing a card game or huddling under beach towels. During times like this, I can’t help but wish my husband had a different hobby. Why can’t he be a history buff or model train collector? Why can’t he build those cute little scale models of classic cars? I used to encourage him to take up carpentry. I could see him busy in a cozy basement woodworking studio, turning out copies of furniture based on pictures I ripped out of Antiques Magazine. Why does he have to have a hobby that requires the unique confluence of so many elusive factors? It could be worse, of course. He could spend every spare moment on the golf course. He could be a die-hard college football fan. He could insist that we travel to all the games in an RV, like the alumni that turn Athens, GA into an ocean of red and black polyester on Saturdays. Or he could be a Revolutionary War reenactor. Worse still, he could want me there beside him, his loyal colonial partner in a corset and thick wool dress, roasting a sheep over an open fire in the middle of August. I have nothing against those who pursue such pasttimes. Indeed, I have friends who do. I’m just glad I’m not married to any of them (and I’m sure they echo the sentiment). 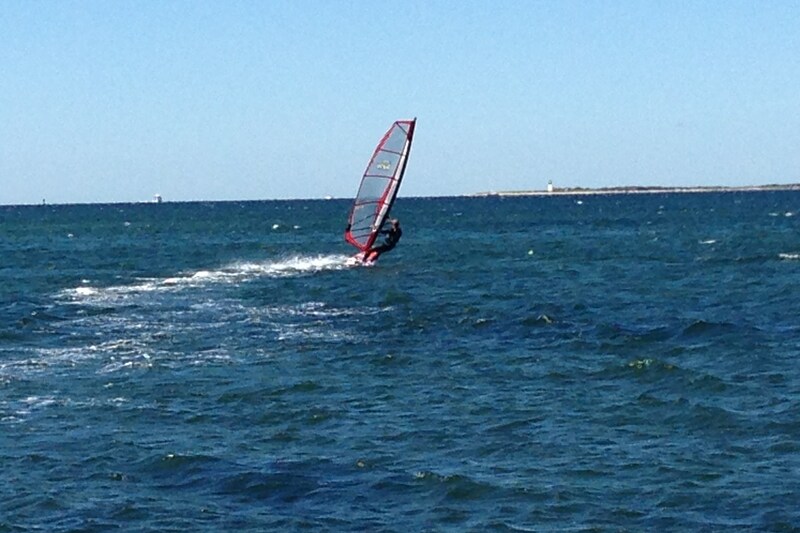 OK, maybe windsurfing isn’t so bad. 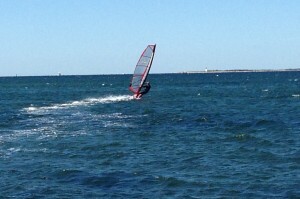 This year at the Cape, H got the best wind we can remember, and I didn’t wish he had a different hobby. The wind was exceedingly cooperative, almost thoughtful. It didn’t insist on being accompanied by freezing cold and driving rain. It was timely; it wasn’t at its peak during the evening when we planned to go into Provincetown for dinner. The wind often blew most briskly shortly after dawn. These windsurfing sessions were the ones that D and I found particularly pleasant, since we were able to sleep through them. But in the late afternoons, as sunset approached, I watched in comfort as H appeared to skim effortlessly across the water. Sometimes, he even soared above it, just for a moment. I think he’d say this: that moment, that perfect, thrilling moment. . .that’s what it’s all about.